Siding Installation Lakewood: Bugs on Your Siding? If you are from Colorado, you probably have seen clusters of black and red bugs on the outside of homes in your area, usually in the fall or spring. If you are moving from out of state, these little bugs, called boxelder bugs, can be a little disconcerting. Are they going to damage your home? Are they dangerous? We will explore what these bugs do, and how you can eradicate them from your home. These little bugs are about a half inch long when fully grown, mostly black with three red lines and wings. The babies are almost fully red and have no wings. As their name suggests, boxelders love the seed pods of boxelder trees, and also will occasionally eat maple seeds. It is only the female boxelder tree that produces seed pods, and boxelders are usually only found in large numbers if there is a female boxelder tree in the neighborhood. Boxelders seek protected places to spend the winters, and the cracks, crevices, or holes in your siding can be a coveted spot. Frequently found on southern or western facing walls, boxelders seek places that are warm. In the spring the female boxelder will lay eggs on the leaves, and cracks and crevices of the female boxelder tree. The eggs will hatch into nymphs that will then feed on the seeds of the tree. No, boxelder bugs do not pose a threat to humans, but they can become quite a nuisance. Because they are constantly seeking warmth during the winter months, they can take up residence in your walls, eventually finding their way into your home. Having bugs constantly crawling around your home is not something most people enjoy, and they can enter the home through gaps in the foundation, gaps in siding, or gaps around windows. They will not bite or sting, and although they may seek out houseplants in search of moisture there is rarely any damage to plants. 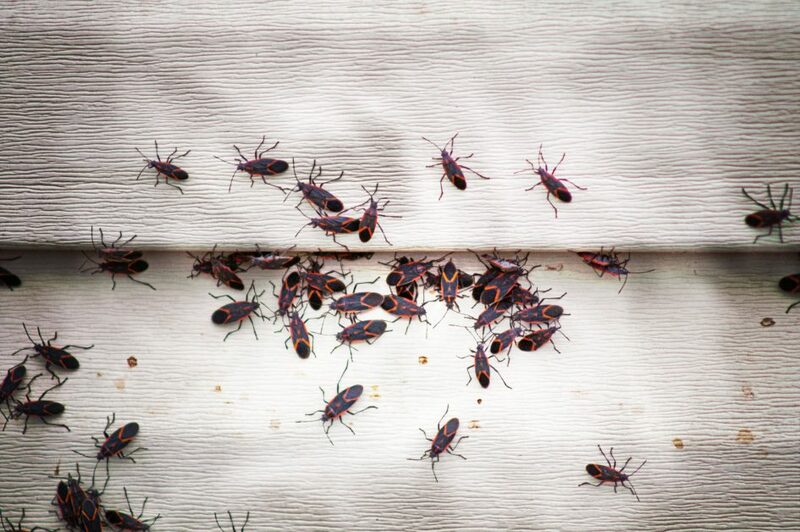 Boxelder bugs do not infest food products or cause damage to your walls, but their excrement can cause staining on siding, interior walls, furniture, or carpet. You should not squash boxelder bugs, this leads to staining. The most permanent solution if you are experiencing large infestations of boxelder bugs is to remove the female boxelder tree in your neighborhood. While this might not always be the choice you want to make (or your neighbor wants to make, if it is on their property), removing the trees removes their food source. Doing a thorough job of sealing your home, including caulking any cracks, can prevent them from entering, but once they are inside it can be harder to get them out. Most insecticides that are safe for the outside of buildings are not effective against boxelders, but Colorado State University Extension suggests using laundry detergent mixed with water as a low cost yet effective solution. This mixture must be used directly on the bugs, and could cause damage to surrounding landscaping or vegetation, so use caution. Vacuuming the bugs up inside your house is another good option, but they may continue to enter your home as the weather cools. In the late spring the bugs will have moved out of your house and into the trees, so this is when you should ensure that your home is properly sealed. Because large numbers of boxelder bugs can cause significant staining, especially to light-colored siding, you should work on prevention measures as much as possible. Stains may be able to be powerwashed off (always be careful to not use too much pressure), but severely damaged pieces may need to be replaced. Have you dealt with too many years of boxelder infestations and your siding is looking a bit worse for the wear? Thankfully, these insects don’t cause structural damage like some other household pests can, but they might really impact the look of your siding. If you are needing new siding installation in the Lakewood area, Airtight Exteriors is here to serve you! Our years of experience with vinyl, fiber cement, and new LP SmartSide siding make us the siding experts you want to turn to. Let us help you with new siding installation, to seal up any cracks or holes, and to make your home beautiful again! If you are in the Lakewood or Denver areas, call us today!